Organic Clean Multi Purpose Cleaner : Hermitage Holdings Pte Ltd.
Bacoff Organic Multi Purpose Cleaner is 100% safe and effective. Tough on dirt and grease. Kills germs and pathogens naturally. Skin friendly, non-corrosive and non toxic. No toxic fumes produced during cleaning. Bacoff cleaning products leaves no toxic residue. Safe for family and environment, from 100% FDA listed food grade ingredients. Our cleaning products in Singapore are totally biodegradable. Contains No Enzymes, No Phosphates, No Artificial Chemicals, No Sodium Laurel Sulphates and No Petroleum Distillates. NASAA certified for organic input. Multi Purpose Cleaner : <product link, once uploaded on the main server>Air & Fabric Disin..
A naturally fresh way to keep your home clean. 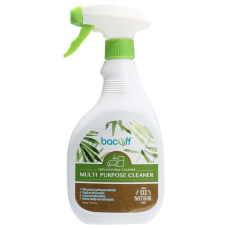 Bacoff™ Multi Purpose Cleaner is the perfect compan..